Description: Welcome to this beautifully maintained brick ranch located on a cul-de-sac in kolsons landing subdivision. Enjoy entertaining in the open floor plan kitchen, living, and dining area. Granite counter tops in the kitchen express the caliber of this home. The five bedrooms include a spacious master with a sizable master bath on the main level. The lower level is complete with bedrooms, a full bath, kitchenette, family room and an office/study area. Added features include a gas log fireplace in the living room and a good size laundry room (located on main level). There is a two car attached garage on the main level, as well as a two car attached garage on the lower level. 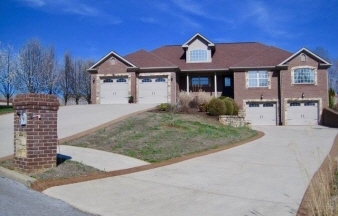 This home boasts two combined lots (.95 acres) with a fully fenced-in back yard. It is only 3 minutes to the slate branch boat ramp, so bring your lake toys. Make your new home in this quiet, friendly community. Data believed correct but not guaranteed. Buyer to verify data prior to offer. Agents read agent remarks.